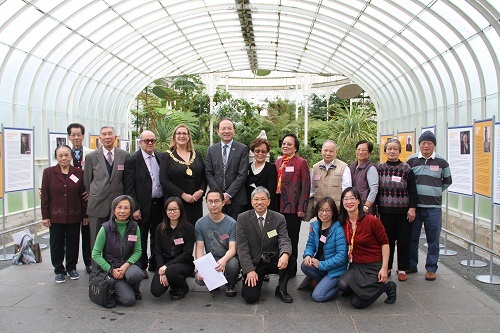 On 28 September, the Oral History Exhibition Launch Ceremony was held at Glasgow Botanic Gardens. 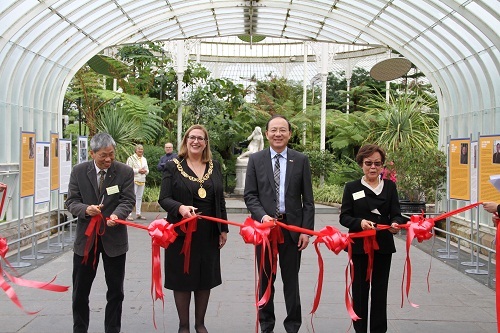 Chinese Consul General in Edinburgh, Mr. Pan Xinchun, Lord Provost of Glasgow, Eva Bolander, representatives from Chinese communities in Glasgow attended the event. Consul General Pan said that the Exhibition displayed the history of Chinese people in Scotland and their significant contribution to the development of Scottish society from the perspective of Hongkong immigrants in 1950s and 60s, embodying substantial historical and cultural values. Lord Provost fully recognized the outstanding achievements made by Chinese communities to the social development of City of Glasgow, praising them as good citizens. She expressed that the City Council would continue to support Chinese community to improve public welfare and encourage the promotion of Chinese culture. Consul General Pan and Lord Provost then presented certificates of appreciation to interviewees and volunteer researchers for the project, viewing the exhibition after ribbon-cutting ceremony.